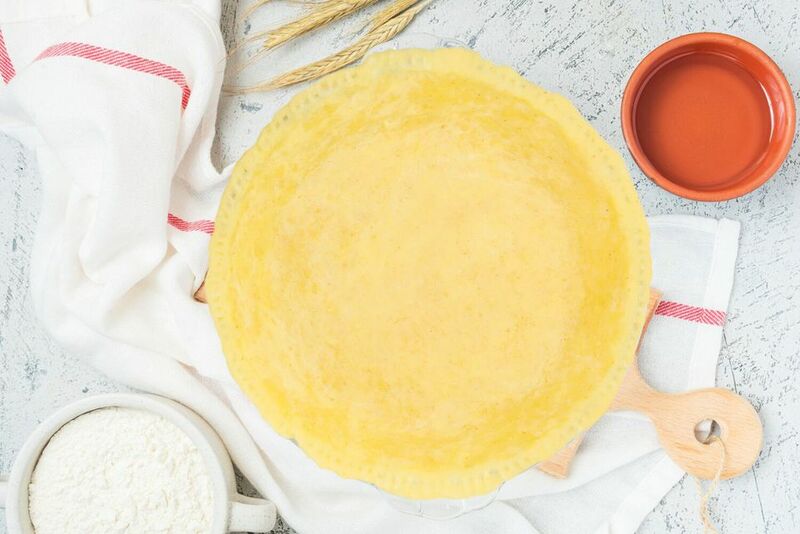 Freezing pie dough and pie crusts can help you plan strategically for your next baking session. You can work ahead, breaking the task up into a dough-making and crust-making session and then leave the pie-making for a later date. With the first part of the job done, you can concentrate on finding, modifying or creating the best pie filling recipe. Even better, you'll be able to ​bake a quick pie with minimal notice, even if you resort to opening a can of prepared filling or using a pudding mix. Whether your aim is an artisanal delight or a quick, no-frills dessert, you are halfway there. This option is great for saving on freezer space. The price you pay is that you will still need time to thaw the dough and then to roll it out. Make up the dough for your pie crust, following the instructions in the recipe that you've chosen. If your pie crust recipe makes more than one crust, divide the dough into individual pie amounts before freezing. Form the dough into a ball and place it in a freezer bag or wrap it in a double layer of plastic wrap. You may even want to do both, allowing you to put more than one ball of dough into a freezer bag. That's helpful if you'll be baking more than one pie at a time. Label the bag and date it so you will know when it should be used. Store your dough in the freezer for up to three months. Use the oldest dough first: first in, first out. To use: Thaw your pie dough in the refrigerator overnight. Then, roll it out as usual with a rolling pin to form your crust. This is a good option if you have enough space in your freezer. You will be able to use the frozen crust on a moment's notice. The drawback is that you can't use your pie tin for anything else in the interim, plus it will take up a lot of freezer space. You could be using that space for ice cream! Make your dough; roll it out, and form your crust in a pie plate. Then, stick the whole thing—pie plate and all—in a freezer bag. To use your pie crust, thaw it in the refrigerator overnight, and proceed with your pie recipe. Alternatively, you can use your crust frozen and simply add a couple of minutes to the normal bake time. Keep a couple of pie crusts in the freezer at all times for easy last-minute desserts. Think about making your pie filling ahead, too. You can freeze or can it. Make your pie crusts in disposable pie plates so that you can make a bunch at once. It will also make them easy to stack in the freezer, leaving more space for ice cream.